This entry was posted in Commuter Rail, GO Transit, Transit. Bookmark the permalink. ← City Hall Task Force Report: A Practical Blueprint for Change? But, hey, UPX has won lots of awards! Ridership and financials is just stuff the public shouldn’t be interested in. Steve: Yes, awards from what might be described as an insider organization of pat-each-other-on-the-back “air rail link operators” even before they carried one passenger. It took only 2 months after the price reduction to reach 8,000 riders per day. That’s interesting, because Metrolinx gave themselves many more months for the 5,000 ridership target to appear when they were at their original pricing. Also, they called the price reduction correctly: at half the price, and over triple the volume, assuming the origin-destination pairs scaled up evenly, they’re quite a bit ahead. But they’d have to be near 10,000 on average to be profitable. I’ll be curious to see if prices start increasing again. The UPX can still be expanded incrementally, but there will be no expansion that can double its capacity without a lot of demolition. Some of the UPX trains run as a two car DMU. If Metrolinx can get some more DMUs, it can make it run in three cars like the rest of the rolling stock. Conversion to electric operation will allow more trains to run per hour, but that single platform at Union will limit growth. Terminal 1 station is also space limited. This means that it is not possible to lengthen the trains either. Ontario’s high speed rail plans are based on running trains on the Kitchener Line. Maybe, if the UPX is capacity constrained, they can remove seats from one of the cars. This way, they can send the passengers to Weston Station instead of Union and transfer to a HSR train for their onward journey. Since it is a few minutes ride to Weston, the lack of seating may not be as detrimental. It is not ideal and shows poor planning. Mr. Del Duca said that it cost the public purse $11 per passenger. Based on the fare prices, the fare recovery ratio is only roughly 50%. Via Rail only recovers 33% from tickets. Even if fuel cost goes down, it will not translate into large reduction in the overall cost to run the service. This is the most variable cost. The number of crew members are legislated by law, so it is pretty constant. United Airlines did a projection when they ordered the Boeing 737 MAX. A 20% reduction in fuel burn, the overall cost only goes down by 5%. The only way for UPX to break even or be profitable is to be involved in the hotel business. If Weston and Bloor Station can be developed as a hotel district. There is a natural advantage here. Most of the airport hotels are located on Dixon Road and Martin Grove. The shuttle bus takes longer than the UPX to reach the terminal due to traffic. Keep in mind that UPX operates only a 4X per hour basis which is much more frequent than any hotel shuttle bus. It does not have to be fancy like the Chateau Frontenac, but something like a Sheraton would be fine. CN and CP operated hotels before, so it would not be out of place for Metrolinx to run hotels. Steve: Metrolinx might run hotels, but they will all be in Scarborough and other places the Libs want votes. The Minister of Tourism can show up for every opening. In May I was travelling from Kipling station to Whitby GO station in the early afternoon (depart about 2:30, desired arrival 4 PM). The Triplinx planner on the TTC’s website suggested that I take the subway to Dundas West station, hop UPX to Union, and catch the GO train. What was unclear was the fare arrangement. I was paying cash. I had to phone GO, who explained that if paying cash, I would have to pay the UPX fare from Bloor to Union, and then separately the GO fare from Union to Whitby. Perhaps Presto streamlines this, but I have heard that there are two different Presto terminals at Bloor, one for GO, one for UPX. In the end, taking the subway clear across to Main Street station and walking to GO Danforth was just as quick and definitely cheaper. 1. As long as you are using stops only on the Weston corridor, the fare for GO or UPX is the same, so it makes sense to take UPX if that’s the next train coming. 3. If you are paying cash, there’s a definite financial disadvantage to using UPX as one leg of a GO trip, since the inclusive GO fare will be a bunch less than the cash UPX fare to Union plus the GO fare from Union onwards. Alas, there may not be GO service going in the direction that you want at the time that you want! Love the idea of a hotel as part of a new Bloor ‘super-station’ with direct access to subway line 2 and the future relief line. Benny’s onto something here…why operate a hotel though when you could operate a casino! What would be most interesting would be to see the per train-mile costs for GO, UPX and VIA. Funny how neither level of government wants to make that information available. I don’t know why you always take a jab at Scarborough. Benny’s comment was in relation to building hotels along the UPX route but do you even know that the UPX does not run to/through Scarborough. First extend the UPX to Scarborough, then we can build hotels there as you propose. Steve: As you very well know, my primary target was the love for photo ops and announcements on every possible occasion, to the extent that Metrolinx’ work appears primarily to provide these events, not to plan and operate a transit network. Why Scarborough? Because the Liberals have already proved that they will spare no expense to buy votes there, and Scarborough has proven itself more than willing to be bought. Via Rail does make that CASM data available. See here. For Q1 2017, each additional seat mile will cost $0.3781 CAD. This is a blended average as different routes cost different. For example, the Canadian runs on Metrolinx, BSNF and CN tracks. Each charge differently for track times. For a route like the Toronto – Ottawa, it is more predictable as Via owns some of the tracks. Another factor is that a Via 1 passenger will cost more versus an economy class passenger to transport due to more space taken, free luggage, free food and access to lounges. Here is the latest CASM information from Air Canada. It cost them $0.116 CAD for each additional seat mile. No information is available on GO or the UPX. Steve: An extra seat mile does not cost money if no resources are expended to carry it. This is the difference between marginal and allocated costs, and a half-full railway car or aircraft can carry another passenger at little extra cost. However, if more service is added, then there is a new cost, although even that won’t necessarily be the same as the existing system average because some system overheads are not affected. The difficulty in reporting transit operating costs runs into the same sort of problem where the marginal cost or saving of a change may not be as big as the fully allocated cost. On a side note, Via’s HFR project will be able to break even by 2030. So given enough passengers (2.5X versus the present) and enough rolling stock, it will work. But the UPX is restricted, so more passengers cannot use it nor will there be enough rolling stock to carry them. Given that it costs the public purse $11 CAD per passenger, Metrolinx will just need to find something profitable to sell to make up the difference. This is strictly business modelling. There is currently no food and beverage service on the UPX. If Metrolinx can get enough people to purchase $7 coffees with $5 pastries, it will be closer to break even. Coffees only cost $0.20, so the profit margin is huge. Pastries are mostly made with sugar which is also cheap. George Bell, I like your idea a lot. For the passengers laying over at YYZ for a few hours, a free ticket on the UPX to the casino will be a good way to make time pass. If I remember correctly, there are geographic territorial protection for each gaming licenses issued in Ontario. This is why there have been no new gaming facilities built in Ontario for a long time. Only North Bay is in the pipeline right now because it is far from OLG Sudbury, Casino Rama and OLG Sault Ste. Marie. Steve: If there were going to be gaming associated with the airport, it is much more logical to put it close by, not to skew the whole Bloor-Dundas redevelopment as some sort of satellite for the airport or as a means of generating traffic on the UPX. Steve said: If there were going to be gaming associated with the airport, it is much more logical to put it close by, not to skew the whole Bloor-Dundas redevelopment as some sort of satellite for the airport or as a means of generating traffic on the UPX. Really, Steve – all those years of civic activism and you still don’t understand how proper urban planning works. First we push through someone’s ill-thought-through pet project, and then we figure out how to gerrymander the city to make it worth our money. Duh! Steve: Sadly, I am a rank amateur. Still working on my plan to widen Highland Creek for ferry service to Scarborough Town Centre. Swan ferries, of course! If we are going to have gambling we could put slot machines in each station and you could pull the handle to get a guaranteed spot, or even a seat for 3 cherries. The rest have to crowd onto the remaining sardine cans. You could have just as easily taken a route 123 bus south to Long Branch loop and GO from there! Quicker and more dependable than the subway plus an easy walk to GO train compared to Main/Danforth. I see ridership falling from 2500 in July 2015 to 2000 in February 2016. Something happened in early 2016 (fare reduction) that took about 6 months to work its way through the system, and had ridership jumping to 8500. Then ridership falls from 8500 in October 2016 to 7500 in March 2017. The single line showing ridership increasing is quite deceiving – likely deliberately so. 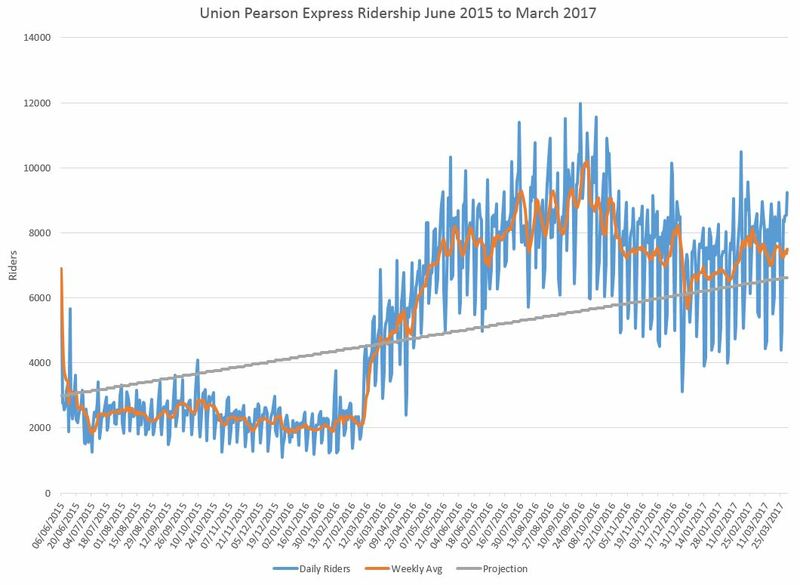 Steve: The single line is not intended to show a ridership increase, but to show what the original UPX ridership projection looked like based on an initial claim of 5,000 per day after one year. It is my line superimposed on the Metrolinx data. I am on the steep learning curve about public transit. What I have learned is that it is important to define what limits capacity before discussing solutions. I respectfully seek clarification of Benny Cheung’s statements. I understand the need to modify the terminal stations. Is there a need to re-build the tracks? Steve: There is a growing problem in the Weston corridor that even after all of the expansion, there may not be enough capacity for all of the trains running there, at least the way GO operates them today. A further problem for UPX itself is a matter of geometry. The airport is on the south side of the corridor, but the platform at Union is on the north. This means that every UPX train must cross over the rails allocated for other services, notably the increasingly frequent Kitchener and Barrie corridors, in both directions. That’s eight crossings per hour today (four each way per hour), and more if the service were operated more frequently. Putting UPX on Track 1 at Union is great marketing but lousy operations. is also unclear to me. The difference between acceleration and stopping times between EMU’s and DMU’s would not be significant and they both hit the same max speed for the same track conditions. There are many posts on this blog that point out that reducing the headways between trains makes a big difference to increasing the number of trains. Headways would be improved with the best signalization system. Steve: Electrification might reduce running times, although I suspect other constraints will limit the benefits. However, if the headway is reduced, this gets back to the track conflict problems I mentioned above, and turnaround time issues at the single track Union terminal. This is example of Metrolinx’s failing to deal with the urban needs of Toronto and reverting to its “intra city” role of GO. I see the UPX line as a potential backbone for urban rapid transit for west Toronto, because so many costs have already been overcome. Rather than combining intra and inter transit demand needs this corridor affords a perfect separation of functions. The incremental costs of modifying some stations and upgrading a signalization system is worth it compared to building a new line or subway to address the urban requirements. Steve: It is really ludicrous to suggest that folks going to the airport want to stand (or maybe perch on their luggage) for the trip. UPX is a design disaster, and it will be interesting to see how it evolves over the next decade once there is no longer a government (and I include even a future Liberal one here) that is paranoid about admitting that changes are required. Those changes will likely be bundled with a rethinking of the corridor overall as an “optimization” strategy, and the HSR service will probably force some hard decisions on Metrolinx planners and Queen’s Park, whoever is in control. It is too bad Metrolynx can’t come up with a true cost of fuel per passenger, seat or train mile or something so we can see if it works or not. My observations while traveling are the 1000 TON GO train stopping at every station and often picking up less then 12 passengers and reaccelerating up to speed and stopping again cannot add up to a very energy efficient mode of transport. 5000 people a day on UPX is less than 3 GO train loads and will not reduce automobile traffic traffic measurably. There must be better ways to improve efficiency then slot machines and hotel cross subsidies or any other cross subsidy. I do try to travel at less then peak times, just as I would by automobile to avoid crowds. The train I wanted to be on is scheduled at Long Branch GO at 2:46 PM and at Danforth GO at 3:25 PM. Triplinx says that to get to Long Branch GO, I’d depart Kipling at 2:07 PM on the 123; to get to Danforth GO, I’d depart at 2:29 PM on the subway. So, not faster to go to Long Branch. The 123C is not the most reliable of routes when Sherway and the big box stores are busy, but at that time of day it was probably fine. Danforth to Whitby is $8.65; Long Branch to Whitby is $11.65. 1. What is the distribution in terms of time of day? Does it not matter a great deal what time of day these trips are, in terms of the actual social benefit? That is if there was lots of road capacity at the time of day a trip was taken, why do we care it it is by car, bus, or train? 2. What is the realistic alternate use for the track space in question, and could we retask the track and/or the very limited right of way to a better purpose, that would yied a higher return? Say we ran to a off airport location, as part of a through service, with more stops, higher frequency to an alternate terminus near/in the core or to a tunnel from say Strachan to Bay? Would using this as a airport area and beyond link make more sense? if there were stops in a couple more places and the theoretical ability to run every 5 minutes on peak? Steve: A five minute headway is not going to happen with the existing track layout and signals. My gut feeling is that if the folks at YYZ ever get their act together on making Pearson a regional transit hub served by the proposed HSR what you will see is a trunk line on the rail corridor linked to the airport by a local shuttle. The tracks now dedicated to UPX will be repurposed for HSR as there is no way so shoehorn yet another set of tracks into the corridor. Of course if the Tories win provincially, we can forget about any of that. In reply to Ed’s comment about there being 2 sets of Presto machines at Bloor (GO and UPX). There is indeed. I travelled from Brampton to Bloor on GO and tapped off on the wrong machine (UPX). The result 2 weeks later was a $25.30 rebate for “Missed tapoffs”. I had apparently tapped on to UPX (With no tapoff) and did not tapoff on GO. 5 minutes later I had tapped on to Dundas West subway station so the record of my movements was clear enough. Steve writes My gut feeling is that if the folks at YYZ ever get their act together on making Pearson a regional transit hub served by the proposed HSR what you will see is a trunk line on the rail corridor linked to the airport by a local shuttle. If they were serious about car alternatives to the airport there would already be a shuttle from Malton Station. (a la Dorval station in Montreal). Steve also writes Yes, awards from what might be described as an insider organization of pat-each-other-on-the-back “air rail link operators” even before they carried one passenger. Canadian air rail link operators? What’s the membership? 1? Steve: There is an international organization, and that’s where the awards came from. The former president of the UPX division got what I can only describe as a “Miss Congeniality” award, giving you some idea of how that organization works.